I am crushing on this new product from DecoArt called ink effects. The possibilities are endless with this paint! You paint on paper and then iron it onto fabric. It creates such a beautiful effect! We made this cool towel tote with it. I will show you how to make one tomorrow! This paint is especially great for kids. They can paint uninhibited on paper and then their creations can be ironed on to fabric to make it permanent art and then use embellish everything from pillows to t-shirts. FUN! Give it a try! 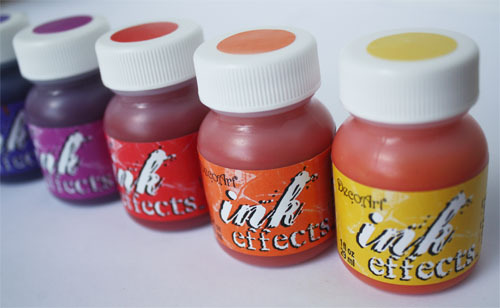 You can purchase Ink Effects later this week at JoAnn stores across the country. 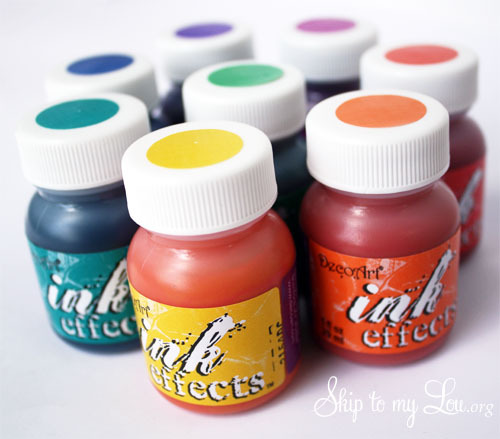 One lucky reader will receive Ink effects in all twelve colors of paint and a fabric primer for cotton fabrics. This looks like alot of fun to try! Just simply leave a comment to enter! No purchase necessary. US Residents Only. Must be over 18. Giveaway will end on July 25 2012 at 11:59am CST. One winner with a valid entry will be selected at random using random.org. Winner will be emailed, the winner will have 48 hours to claim their prize or another winner will be selected. Cindy Hopper and DecoArt are not responsible for lost or undelivered emails. What a unique product! My girls would love this! I sent a message via Twitter about the contest, followed Skip to My Lou on Twitter, and liked Skip to My Lou and Deco Art on Facebook. Thanks for the chance to win! I Like DecoArt on Facebook as Jennifer Hoyt Hendrix Hutchinson!! Would love to win for back to school projects for the five babies! I Like Skip to my Lou on Facebook as Jennifer Hoyt Hendrix Hutchinson!! Thanks for this amazing chance! I tweeted abt the giveaway!!! O My Stars! I would love to win!!! This looks so fun! I liked skip to my lou on facebook too! This looks so fun to play with! These paints are so cool! I would love ro make my son's artwork into a quilt! Thanks for offering two great giveaways. I could use the paint but I would LOVE a Cameo. Thanks! and have a wonderful day. Would love to use these paints to make quilt blocks! Hi, I just wanted to sign up for the silhouette giveaway, I sure would love to win one of these! I also wanted to tell you that I love your site! I've taken a little bit more time today and looked around, you have sooo manyyyyyy great ideas! Thanks for sharing and INSPIRING!!!!!! I liked Deco ARt on facebook! I look forward to seeing Skip to My Lou in my inbox!! Wonderful ideas to try... and I have tried so many!!! Ink Effects looks like fun!!! This looks awesome! Can't wait for it to hit the stores & thanks for the chance to win :D Have a blessed day! Watching for them in the store. Looking forward to using DecoArt Ink Effects. I like DecoArt on facebook. I so want to win this! I've had my eye on this product for some time now. Thanks for the chance to win. What an AWESOME giveaway! I love the colors! ok...this lookes like it could be some serious fun! 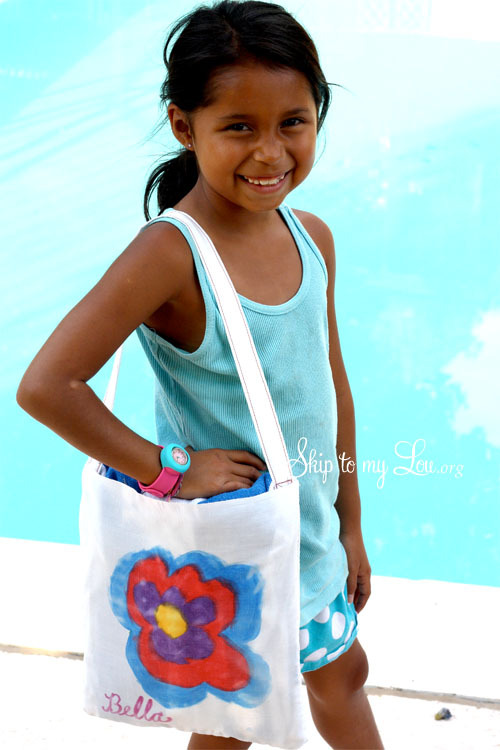 i love the totes, and it would be fun for my son to make a gift shirt for his sister's upcoming birthday! I already Follow Skip To My Lou on Twitter! I like Skip To My Lou! What a colorful blast it would be to play with those colors! These paints are wonderful and I'd love to have the set! I follow you via email and also like you on fb already. Thaank you for the chance to win this new set of paints! I pinned you to my Pinterest favorite blog board! I would love to win your decoart ink giveaway!!! Oh my, I just looked into these cool inks a couple of days ago. I so need these for my 6 mos granddaughter's ones....love this. Thanks so much for the chance to win...wow! I "liked" you on FB, I already get your emails and I enjoy them. I made the cake in a jar recipe for my daughters teachers, they were a hit!! Thanks for all your ideas, I will be making the stepping stones this summer with my kids, I think it'll be fun!! My daughter would love this paint. Thanks for the chance to win. Looks like loads of fun, can,t wait to do some of my painting projects with it. Love all the colors from the new Ink Effects. Thanks for the chance to win. I already "love" STML on f/b! oh the ideas going on in my head for what I could use this paint for! I tweeted! Thanks for the chance! I cannot WAIT to try these new paints. I plan to make tote bags with my daughter for everyone for Christmas. So many possibilities!!! I'm just starting out with art journaling and would LOVE to have a set. I now follow Skip To My Lou on Twitter. Thanks for this giveaway- these paints look really cool. If I don't win, I'll be buying them for sure! Deco Art paints are always great! I think this new paint would be so great on projects. Thanks for the chance to win this great giveaway! This sounds wonderful, maybe even I can do this without mishap?? These new SecoArt paints look great. I like Skip to my Lou on Facebook, too! What a fun new craft! I tweeted the giveaway. What a fantastic product, ahh the Christmas ideas are going crazy in my head!!! I like both on FB! I liked DecoArt on FB! Wow, those look like fun! I'd love all 12 colors. I'm so anxious to try these paints! I would so like to try this with my 3 grandkids! I follow you on facebook! I'm planing to use this to liven up a bland white shower curtain. Thanks so much for the chance to win these paints! I'm always looking for some different kind of craft to do with my daughters, and this sounds like so much fun! How great that they can customize their own tshirt, beach bag, or anything else! So many wonderful craft techniques so little time. I'm so intrigued by this ink process. I love learning new things. Can't wait to try them. This looks like an easy and fun way to paint and craft. What a great product, would love to try it. I follow Skip on Twitter! I like DeocArt on Facebook! I like Skip on Facebook! I liked DecoArt on Facebook! I liked STML on Facebook! I followed STML on Twitter! Woohoo! I watched video demos on this product and I NEED it! Thanks so much for the chance to win it!!! I "like" Deco Art on Facebook! I "like" Skip To My Lou on Facebook! What a great giveaway. I sure would love to try those!! I'm new to the blogging world! It's AWESOME what Pinterest has allowed to come together!!! I'm an artist, a newbie at that also....so these new mediums are GREAT!!!!! LOVE THIS IDEA!!! Looks quick and EASY!!! This is a GREAT NEW CONCEPT! Made Easy so even kids can see their artwork come to life!!! I'm sure we could put these to good use! I have been waiting for something like this to come on the market! Love it :) Looks cute. Sadly, I don't have a Joanne's near me. Nearest one is in another state... at least 3 or 4 hours away :( Oh well!! I'd love to try it! I hope I win! That is such a cute box! I 'd love to make one of those too! Awesome! I think these would be great. I am always on the look out for craft ideas for a kids group that I do. They love to paint so these would be great. Liked Skip to my Lou on FB. What a fun product! Can't wait to try it! My kids would have so much fun with this paint. I followed Skip To My Lou on Twitter. My name on Twitter is SocietySuckkss. I would love to start designing my own kind of clothes and helping embellish them to create this hipster feel. I'd love to also give my friend a bottle or too, so she can do this as well. I follow DecoArt on fb! I follow Skip to my Lou on fb! I love to paint and would LOVe to try these paints out! Thanks for a chance to win! I am already on your FB page. I liked your FB page before. I also liked Decoart on FB. I do want to try this paint out. I'm an elementary Art teacher and will try this with my students. This looks like LOT of FUN! I watched all the videos on YouTube and can't wait to try these! I already paint with acrylics on shirts and bags, would be sooooo excited to win these!!! Can't wait to try them! I really, really want to win them!! I already paint with acrylics on shirts and bags, would be sooooo excited to win these!!! Can't wait to try them! OK, I have also "liked" DecoArt over on Facebook. I hope I'm doing this correctly, with a separate post here for each thing I did. :) Thanks again for a chance to win. Would love to win these. Thanks. Would love a chance to try these! this is sooooooooooo cool this supply could be used for so many amazing stuff !!!!!!!!!!! Already a FB and Twitter follower of Skip to My Lou and now a follower of Deco Art on FB! This new product looks amazing...simple and FUN! Keeping my fingers crossed that I will win these awesome paints - I'm so inspired by the possibilities! I've liked STML & Decco Art on FB, following both & retweeted on Twitter.... hoping for luck!